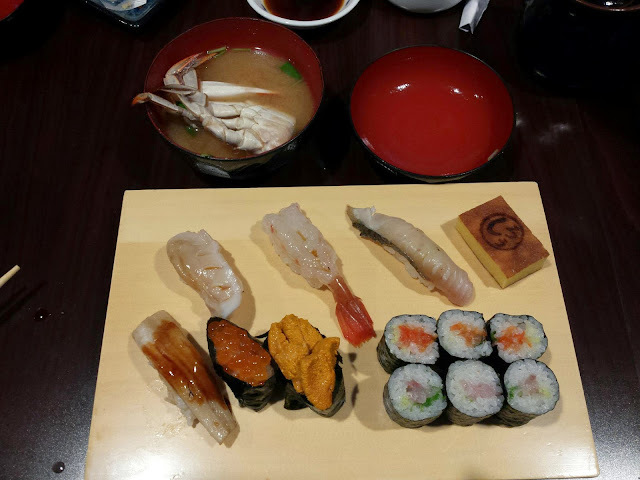 I recently went with my family to Shiro's Sushi and most of us went to experience the omakase. I opted for the premium option (all sushi) where others decided on the dinner one (variety including appetizers and dessert). They also have a market price/all you can eat one at the sushi bar but that's for another experience! 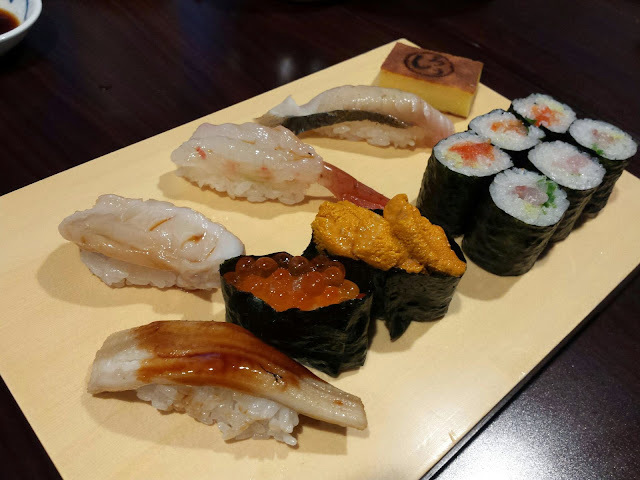 The premium omakase included 4 dishes, each with different amounts of sushi. I wish I paid attention but I can only remember that the middle piece was flounder and the last piece was snapper (I believe). I did remember it being nice and fresh with the perfect amount of wasabi to compliment the pieces. This dish included all salmon pieces. The first pieces was a fattier marbleized Atlantic Salmon with a sprinkle of sea salt. This was absolutely buttery and amazing and the salt really brought out the smooth flavor of the salmon. The second pieces was a leaner piece of Atlantic salmon with sweet onions wrapped with nori. 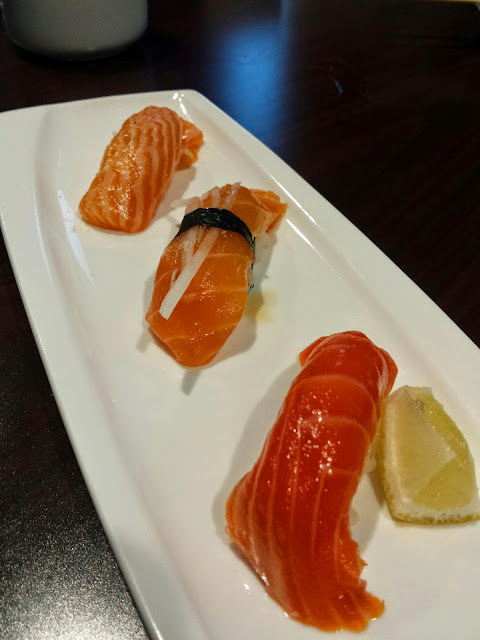 I loved the that the onions weren't sweet and didn't overpower natural flavor of the salmon along with adding a nice crunchy layer of texture. The 3rd piece was my favorite. A piece of wild copper river salmon paired with a slice of lemon. Not only was this piece super fresh, but the lemon really brought out the natural rich flavors of the copper river salmon. This whole set consisted of 4 different pieces of tuna. The first was akami a lean red meat of the Bluefin Tuna. This piece did indeed have a nice lean texture and was firm to the bite with a red beefy/meat taste. The next piece was chutoro , a fatty part of tuna found on the belly side that was pretty smooth and had great flavor as well. Next up was a piece of seared akami that I actually liked a lot (some of my family didn't as much). There was a smoky flavor that really came through and I felt just went really well with the sushi rice. The last piece of tuna was otoro, the fattest part of the tuna belly's lowest section that was just melt-in-your-mouth butter smooth! Not for everyone because of the extreme fat content, but I loved it and it was such a treat. You can see the lighter coloring and fat marbling of this succulent piece. This last plate came with the rest of the nigiri. Geoduck/ (mirugai) I think - such a tender and sweet piece. It's similar to hokkigai (surf clam) in that crisp texture, but had the sweetness of a scallop. Amaebi-Also known as sweet shrimp, this is probably one of my all time favorites (apart from Uni which will be discussed later). The sweetness of the shrimp is perfectly balanced with the rice and slight shoyu on top and the best part is that they deep fry the heads and serve it to you as well! King Mackerel/Aji - This mackerel was smoked which added a whole different layer of flavor to the nigiri piece. It almost reminded me a smoked halibut or salmon, but more mild. Anago-this was a salt-water eel that I rarely have because I usually end up getting fresh-water eel (unagi). 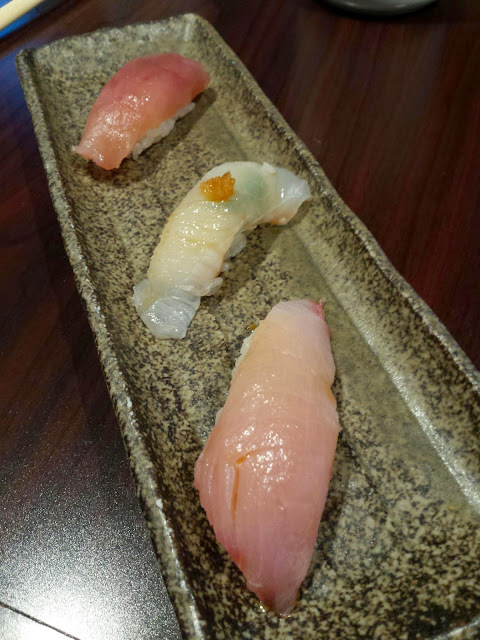 There is a definite textural difference--anago is softer and almost has that melt-in-your-mouth quality to it as well. 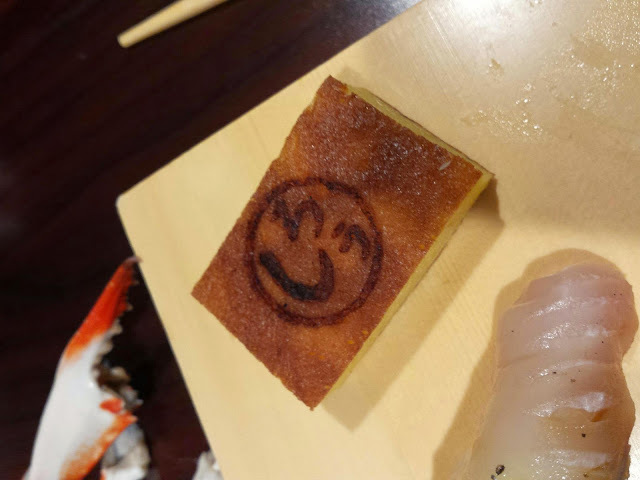 The sauce on top didn't really allow me to taste the natural sweetness of the eel, but I would say it was a bit sweeter and smoother than unagi. Ikura/salmon roe- not my favorite but I didn't mind this one because they didn't overload the gunkan boat with too much of the roe. Each piece or roe is a like a pop of sea salt flavor exploding in your mouth. Uni/sea urchin - my absolute favorite! This did not disappoint and I noticed that the flavor was quite mild than other uni I have had in the past. The natural nutty flavor wasn't as prominent but it was still delicious. The texture was nice and creamy and was overall just delicious! We had two little maki rolls which I didn't care for too much (though I did like the one with shiso in it). 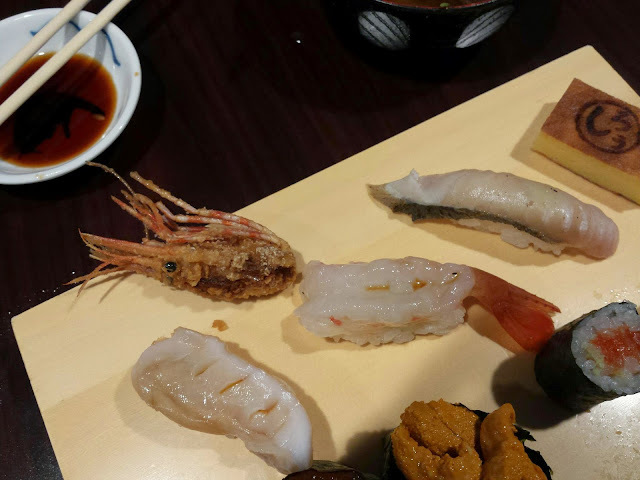 I much rather have traded those rolls for another piece of nigiri--either hotate (scallop) or anther piece of uni! The last piece that I saved for the end was tamagoyaki/egg nigiri. It is always sweet and I saved it for my 'dessert'. They even imprinted 'Shiro' on the egg which made for a nice touch! The end of the meal also came with this blue crab miso soup which came with a whole half a crab! It was a bit too much work to eat the meat out of the crab but the soup itself was a nice ending to everything. 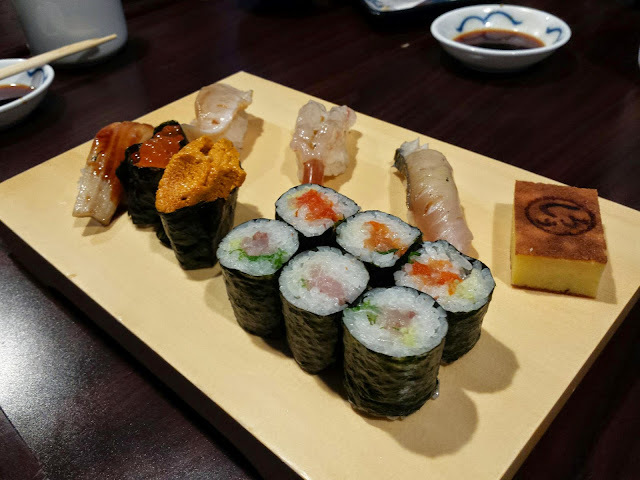 Now I know many people say to not do the omakase in this way because it isn't the same experience as eating at the sushi bar, but with 10+ , that's not gonna happen. I quite personally really enjoyed the experience and pieces of sushi that came out. I would definitely do it again! Maybe even at the sushi bar next time if I am with only one or two other people. The only downside is that if you make reservations, they tend to rush you--I mean come one, we are spending over $1000 easily for everyone's meal together and we can't get extra time in the room? I guess they just want people to come in and out faster but other than that, the meal was wonderful and the service was still great. 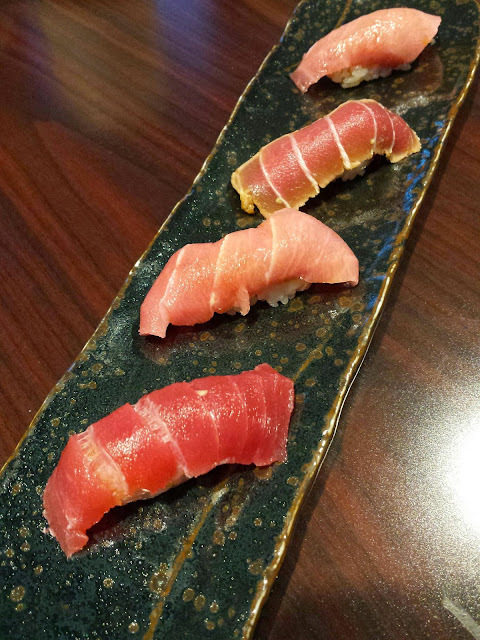 Readers, have you tried an Omakase before? What is your favorite type of sushi? Let me know!